This year for Christmas in Different Lands each post is exploring some aspect of Christmas in at least three different continents. Today we are looking at candles. How do you use candles at Christmas time? With electricity there are not as many uses as there once was but some are still used for special events. 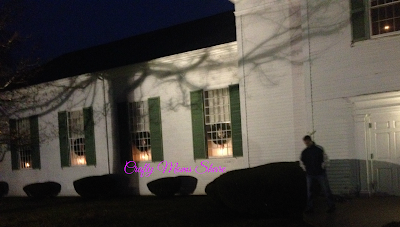 In New England often there are single candles (and for some multiple candles) in the windows of a house or church. I shared a bit about Christmas in New England last year. Candles are also used in many other ways. Often there is a candlelight service on Christmas Eve at church as well as the Advent wreath candles during Advent. I shared a bit about our Advent wreath a couple of years ago. Many countries especially in Europe use Advent wreaths and/or Advent candles. Countries like Germany, Austria, Croatia, and Belgium often have Advent wreaths as well as the United States. In Denmark there are special calendar candles called Kalenderlys. These candles are burned a certain amount each day to count down to Christmas. The other main use for candles in Europe is on Christmas trees. Now often electric candles are used instead of real ones, but there are still some who use real ones in Switzerland and Austria. In Germany there are also schwibbogen or decorative candle holders from the region of Saxony, Germany. The size and number of candles varies. (Source) There are also Christmas Pyramids or Weihnachtspyramide in Germany. They are more like a carousel that is powered by the heat of the candles. (Source) We have friends who have a beautiful one with many tiers. 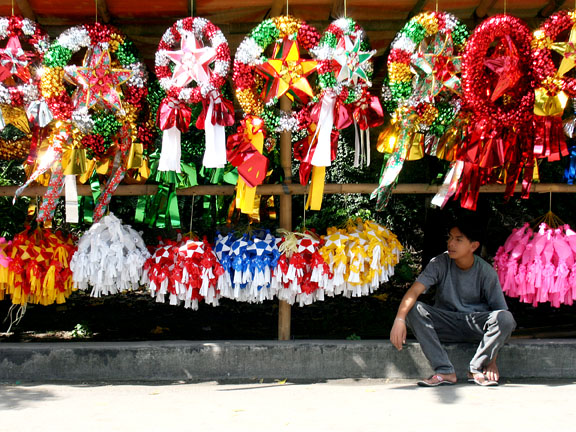 In the Philippines they have Christmas parols or star shaped lanterns to light the way to church or town. We found a tutorial to make a simplified (and non-lite) parol in All About the Philippines by Gidget Roceles Jimenez and illustrated by Corazon Dandan-Albano. (Tuttle Publishing sent us this book to review which we will be doing very soon!) 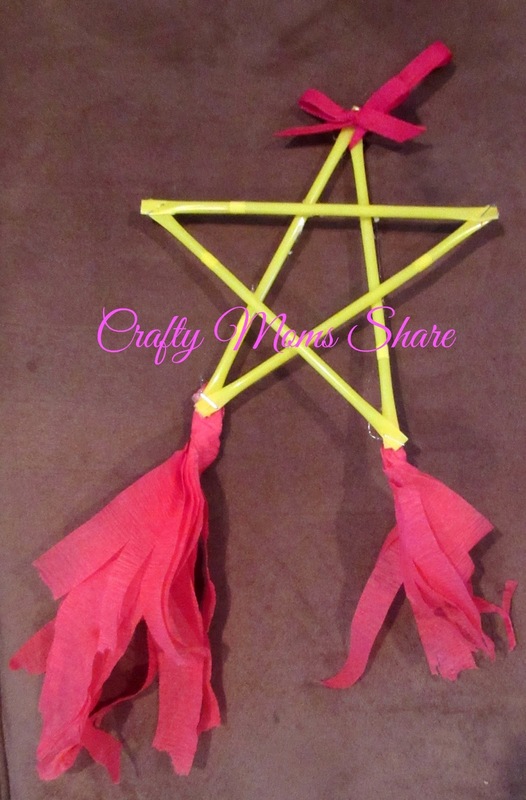 We made a parol out of straws, ribbon, streamers, staples and glue. More modern parols are now electric and very colorful. In Mexico the children are given candles to parade in the streets during the Posadas. The children parade with a statue or people representing Mary and Joseph searching for a room at the inn. They knock on several doors seeing if there is room and there is not until they come to the appointed house for the night. In Finland there are often lanterns hung from the trees of cemeteries since people often like to visit the graves of loved ones and leave the lights there. They also make ice lanterns to light the way due to the early darkness in some parts. In parts of Norway it is tradition to light a candle every from Christmas Eve to New Year's Day. In Iceland children often receive candles as presents. In Lithuania some people light a candle at their dinner table Christmas Eve in remembrance for a person who has passed away. In Sweden girls wear a crown of candles for St. Lucia's Day celebrations (December 13th). In India oil lamps are placed in windows by some Christians. In the Southwest of the United States and other countries (especially in Central and South America) it is common to use luminaries or farolitos to light the path or buildings. Often they are paper sacks filled with sand and a candle. This post is part of Multicultural Kid Blogs' Christmas in Different Lands Blog Series. Be sure to check out the other posts in this fun series!